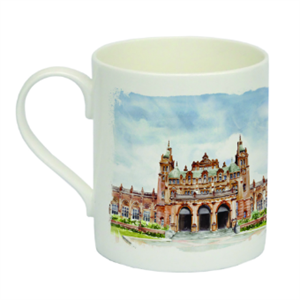 A beautiful printed china mug featuring a colour image of Kelvingrove Art Gallery & Museum painted by Karolina Grudzien. Karolina Grudzien is a textile designer, with a passion for embroidery and illustration, in particular watercolour. Working in a range of mediums, she combines her fine art talents with her love for wildlife and nature, colour and pattern. Originally from Krakow, Poland, now based in Scotland, Karolina graduated from Edinburgh College of Art with honours in Textile Design. The Kelvingrove China Mug is the perfect souvenir of your visit.